Throughout the year, nature offers an abundance of wild foods suitable for human consumption. In Britain, there is a huge variety of native wild food that can be foraged and picked for free, with over 400 species of wild plants deemed safe to eat. And proximity to the countryside doesn’t necessarily affect the ability to gather free edible wild foods; they can be found just as easily in city parklands, back gardens and even derelict waste grounds! Whilst wild food offers one distinct advantage – that it is free – it also offers another ‘trump card’ over supermarket produce. Many wild plants actually contain relatively high nutrient levels, spectacularly outdoing commercial produce. For instance, dandelions contain twelve times more Vitamin A than the same weight of lettuce, rose hips contain sixty times more vitamin C than lemons, and fat hen contains more iron, calcium, protein and vitamin B than spinach. It’s worth noting that this article covers a few choice wild foods, representing just a fraction of the free edible foods available throughout Britain at various times of the year. The first contender in our selection of free edible wild foods is the humble dandelion. This oft-reviled ‘weed’ is a prolific hardy perennial, with the roots and leaves available almost all year round. Dandelion leaves are bundle packed with vitamin A, B, C, carbohydrates, fat, calcium, iron and phosphorus. To enjoy them at their best, pick new young dandelion leaves in spring, as the older the leaves, the more bitter and fibrous they become. Once washed thoroughly, the shredded baby dandelion leaves can be served, as the French do, as a salad bed with bacon or belly pork. Alternatively, the leaves can be mixed with other salad leaves to ‘pep’ them up, or as an accompaniment to rich meat and poultry dishes. If, however, even the baby dandelion leaves prove too bitter, they can be mixed with sweet vinaigrette dressings, or mixed with raisins, chopped nuts or sesame seeds to balance the flavour. Dandelion flowers can also be deep fried in tempura, or the petals used to add an extra flavour dimension to bread and cake mixes, as well as salads. Rose hips (rosa canina) are famed for their ultra-high levels of vitamin C, with each berry packing in around 10mg of vitamin C, as well as vitamins A and E. Available from late summer and best picked in autumn when they’re softer, as a wild free food, rose hips have a plethora of uses from puree through to soups and syrups. Once collected, the hips should be thoroughly washed, before being topped and tailed. Wild rose hips can be dried and stored, or used immediately. In both cases, the hips will need seeding (easiest when dried), making sure to remove the fine hairs inside the berries, which can cause significant irritation to the stomach, and as such should NOT be ingested. To make rose hip jam, simply seed around 1lb of rose hips, then stand in water and a little wine for 3-4 days to soften until soggy. You’ll then need to process the soggy hips into a puree. Bring 1lb sugar to the boil slowly, and add the puree, combining the mixture thoroughly before turning into sterilised airtight jars for storage. Another prolific wild plant often referred to as a weed, is fat hen (Chenopodium album). Fat hen has had a long history of culinary use dating back to prehistoric times, and its young leaves can be used both cooked and uncooked. Like spinach, the tender leaves can be quickly boiled down and used in a wide variety of dishes, whilst the young tender stems can be steamed and served with butter. Uncooked young leaves can be shredded and added to salads dressed with vinaigrette. The bugbear of many gardens, and readily available in the wild, stinging nettles are actually a fantastic source of nutrients. Cooking (boiling) and drying the nettles actually removes the hairs and the sting, with the younger leaves proving the most desirable. If cooking, remove the stems (gloves on first!) and cook the leaves down in boiling water for a few minutes, until soft. The nettles prove to be a nutritious green ‘bulk’ addition in soups and stews, and are best flavoured alongside garlic, onions and herbs. Nettle soup can be cooked by boiling down the young leaves within 10 minutes, adding vegetable stock, sweated garlic and onions, herbs and cracked black pepper, as well as potatoes (diced) and/or soaked broth mix. You can add crème fraiche or cream to the mixture too, for some extra depth. 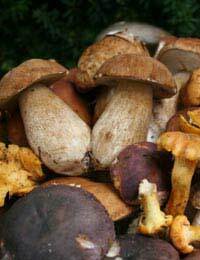 Astonishingly, only 4 out of about 3000 species of native British wild mushrooms are seriously poisonous. That’s not to say you shouldn’t go mushroom foraging without guidance – it’s always worth taking a long a book for identification purposes, just to be sure. Shaggy cap (Coprinus comatus) and Puffball (Lycoperdon perlatum) are two versatile wild mushroom varieties, although shaggy cap can cause nausea if eaten alongside alcohol! Puffball mushrooms in particular are fantastically easy to cook up – fried with onions and garlic, or alone, they make a tasty addition to many breakfasts, lunches and dinners.